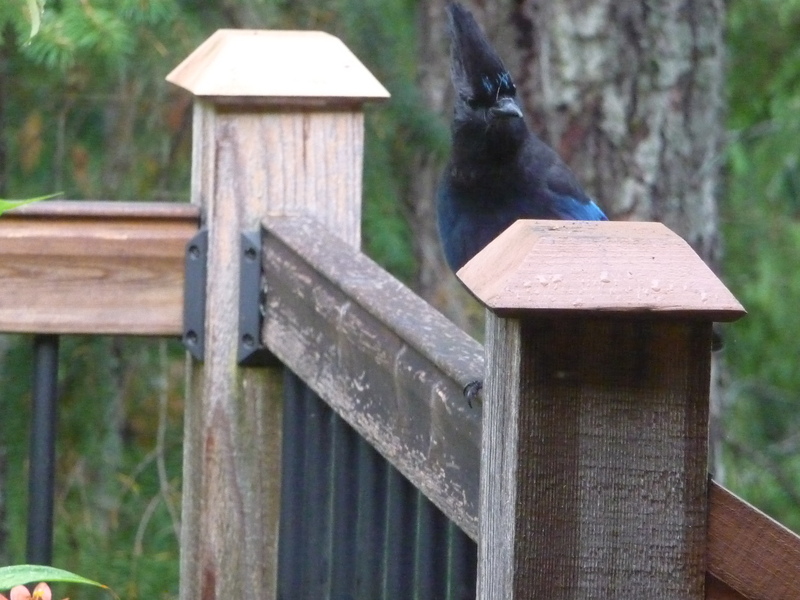 Every year, around this time, the Steller’s jays return to the Douglas firs outside the sliding doors leading to our deck. They’re around all winter, hogging the bird feeders, chasing the more timid birds away, even drop-kicking the sliding doors occasionally to get our attention. They disappear for the nesting period and return around mid-September. I love them. Is there any colour more beautiful than the blue of their plumage? A blue hidden in their name, Cyanocitta stelleri (“cyan” from Greek κυανός, transliterated kýanos, meaning “dark blue” and the specific name for Georg Steller, a zoologist and botanist who was part of the Russian explorations of Alaska in the early to mid-18th c.). The same ones come back year after year. For how long? I don’t know that. But the oldest Steller’s jay on record was 16 years, one month. So chances are some of ours have been visiting for at least a decade. And I know at least some of them are regulars because they do exactly the same things to get my attention. They follow me around if I’m outside. If I’m in the kitchen, they sit in the firs and yell. I put a few pumpkin seeds on one of the posts and within seconds, an adult will swoop down and cram as many into its mouth as possible. When that one leaves, a juvenile — these ones don’t yell; they don’t do that until they’ve been around a bit and learned the routine — will come for what’s left. And how do I know the adults? They have black heads and blue eyebrows. This guy has just eaten every seed. In a few minutes I’ll put more out for the offspring — their heads are more brownish and they don’t have the eyebrows. But imagine having those to look forward to as you grow into adulthood! ~ by theresakishkan on September 30, 2014. This entry was posted on September 30, 2014 at 4:41 pm and is filed under Uncategorized.You can follow any responses to this entry through the RSS 2.0 feed.You can leave a response, or trackback from your own site.